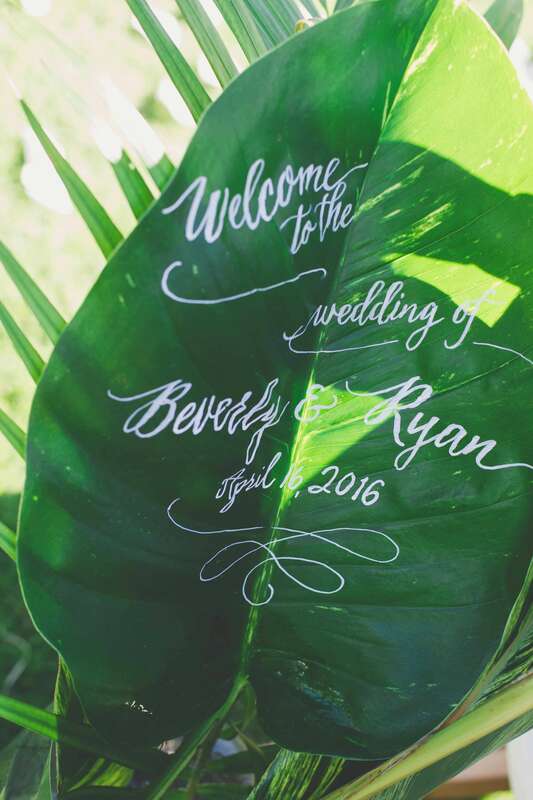 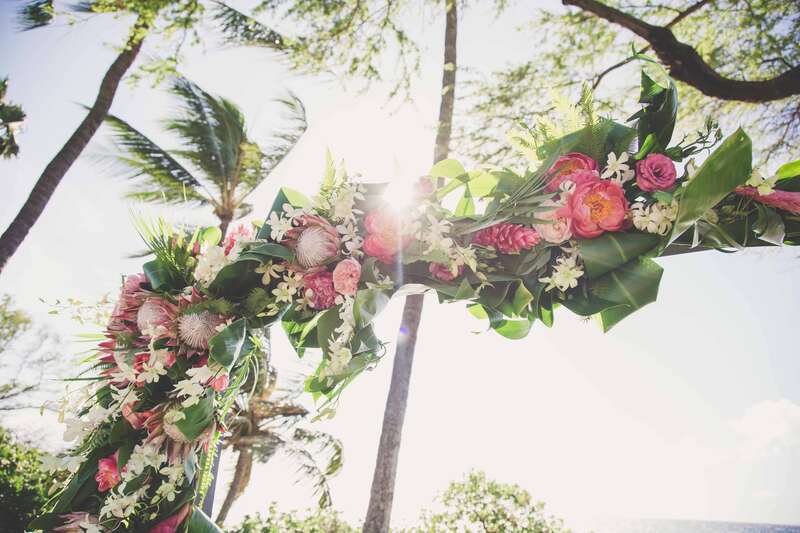 Beverly and Ryan’s boho chic Hawaiian wedding is quintessentially cool and is what we like to call, understated glamour. 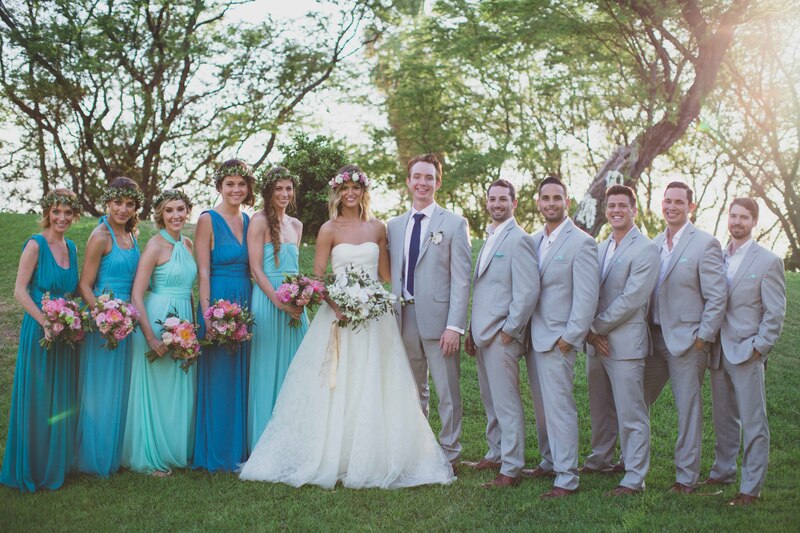 The entire thing was impeccably thought out, but made to look absolutely care free and effortless! 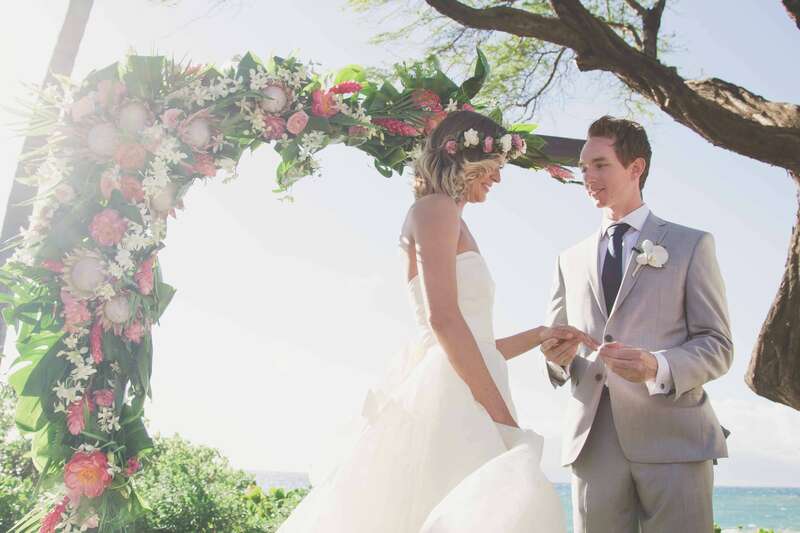 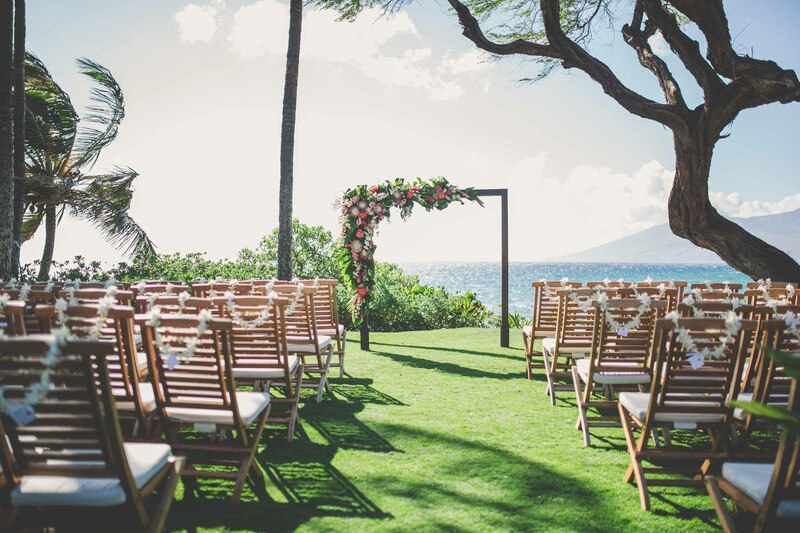 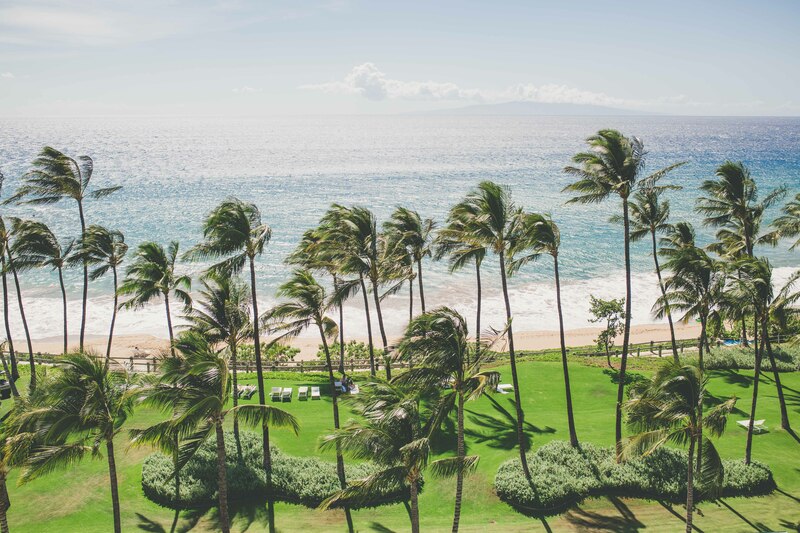 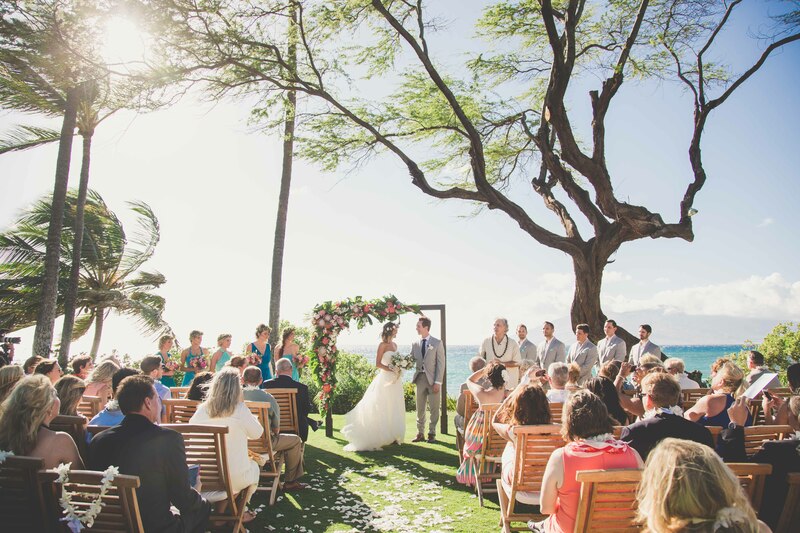 With the Andaz Maui as the backdrop, you really don’t have to do much to create a breathtaking setting! 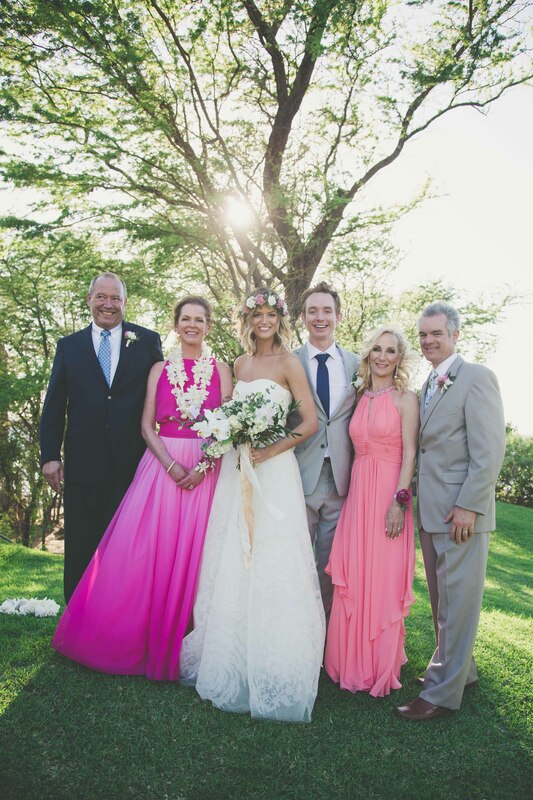 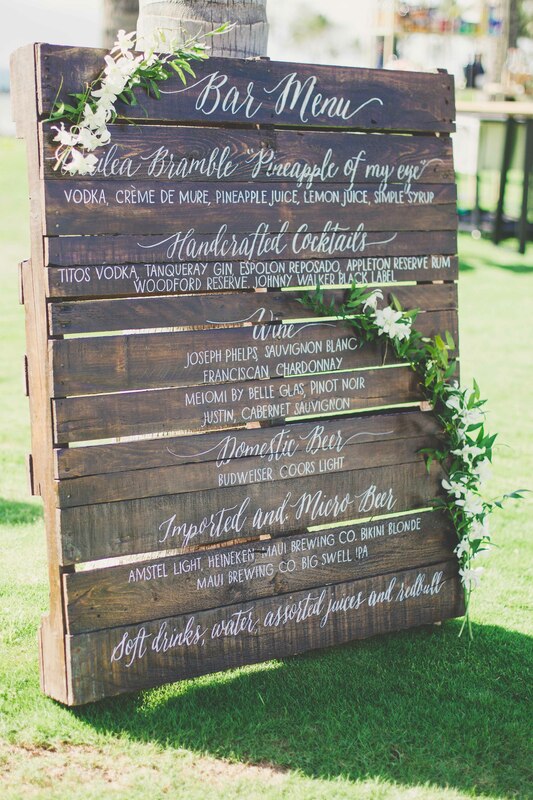 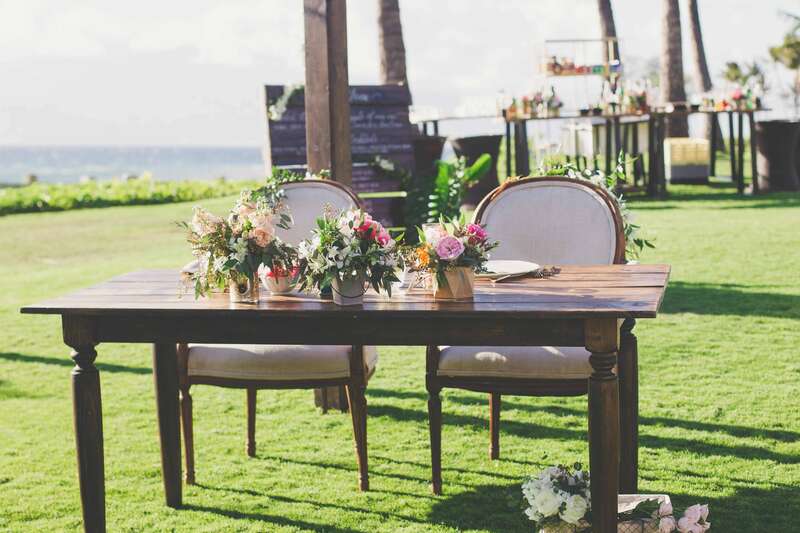 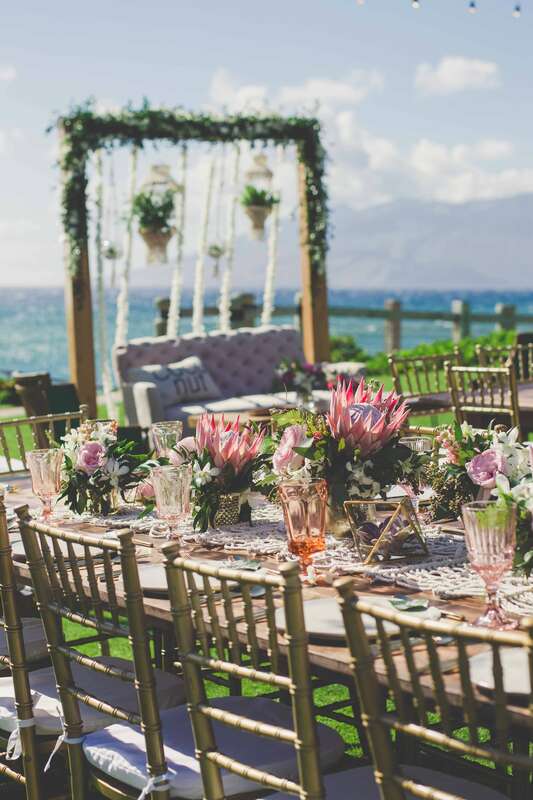 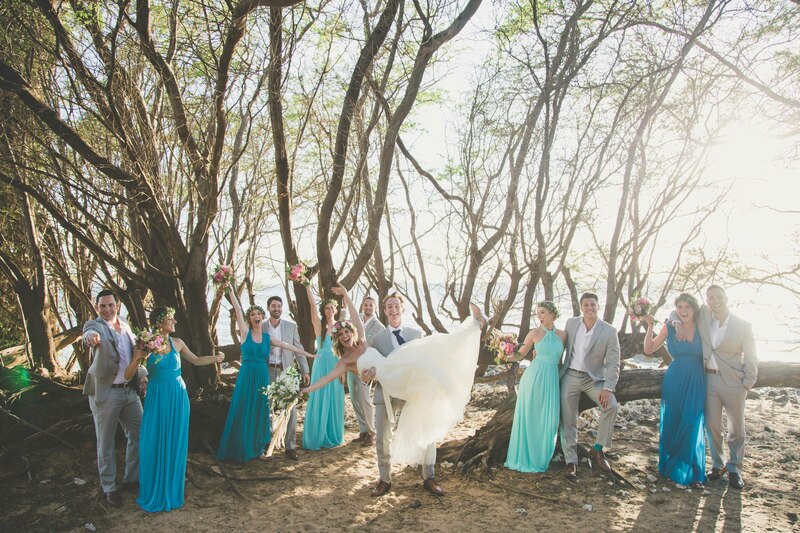 When we think of boho chic, we think of flowy dresses, flower crowns, and a relaxed atmosphere; set that on the cliffs of Maui with pristine aqua water behind you, and you have Beverly and Ryan’s wedding celebration! 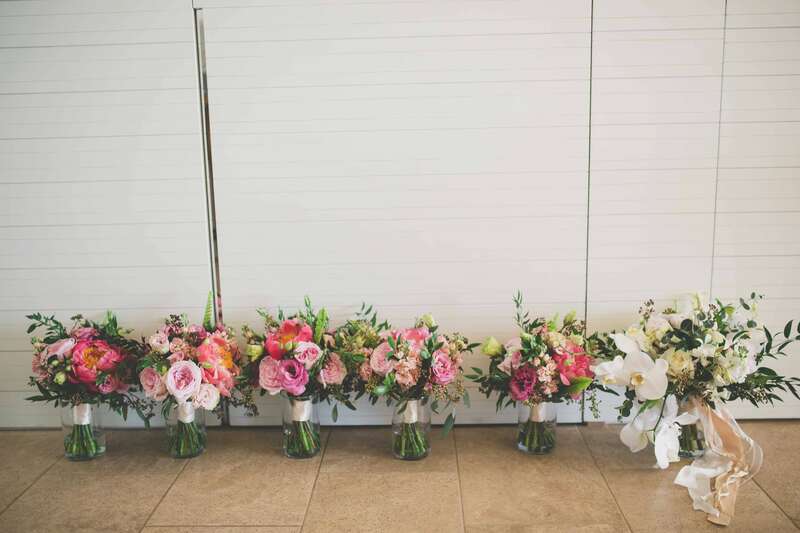 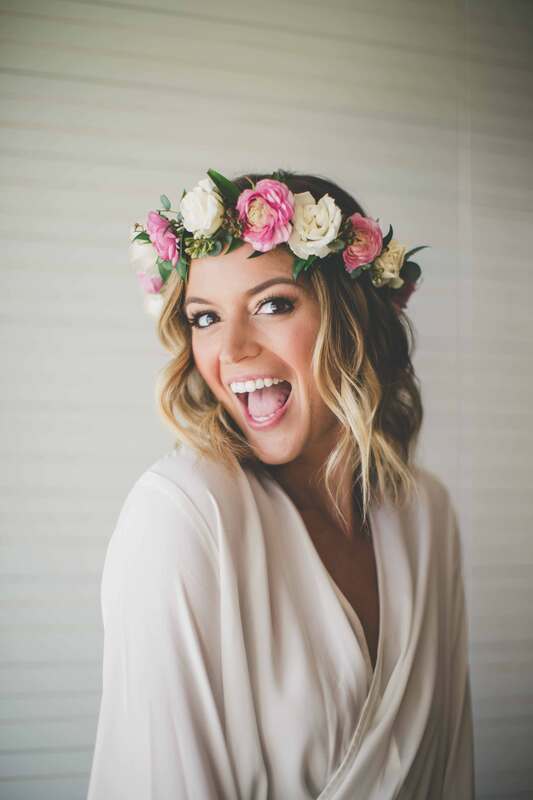 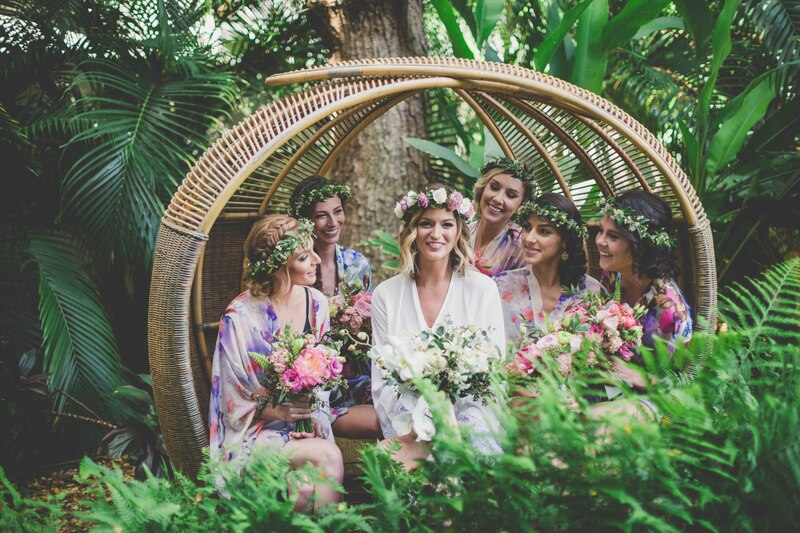 We immediately fell in love with Beverly’s crown of flowers, and the photos of she and her bridesmaids hanging out on swing in floral robes the morning of the wedding! 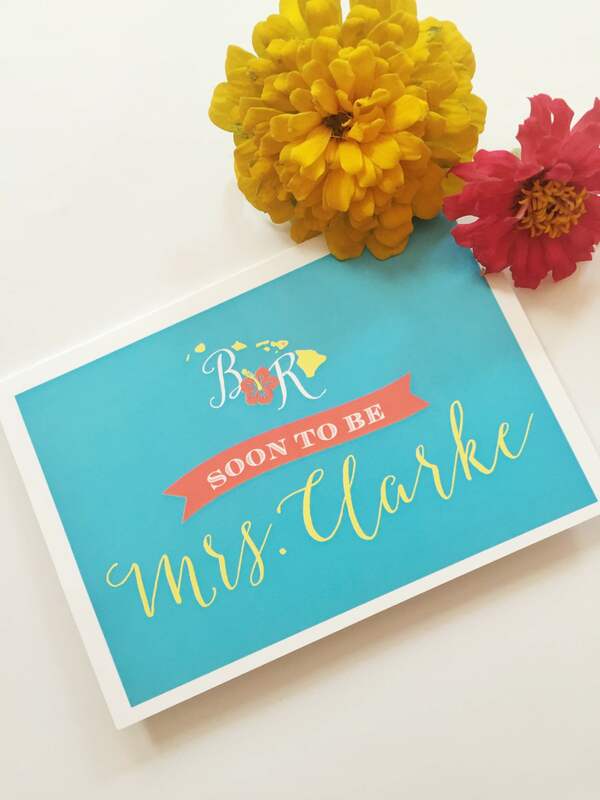 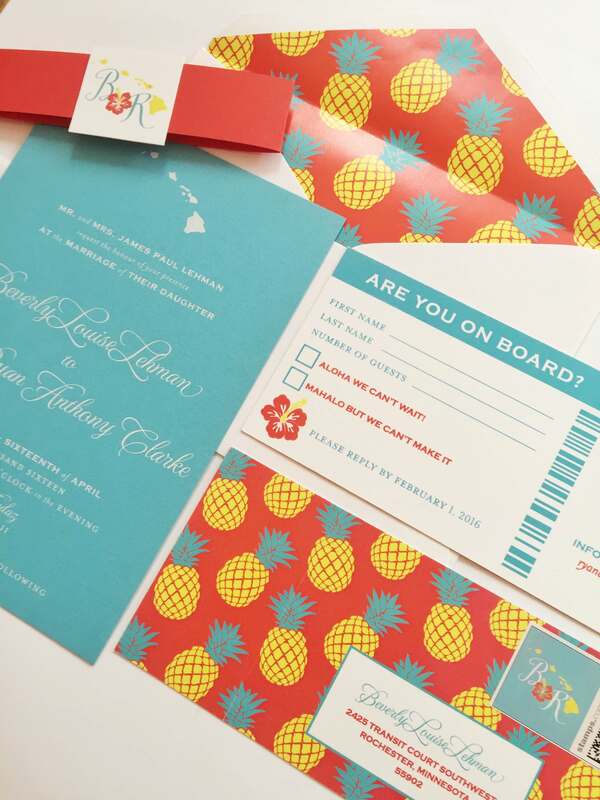 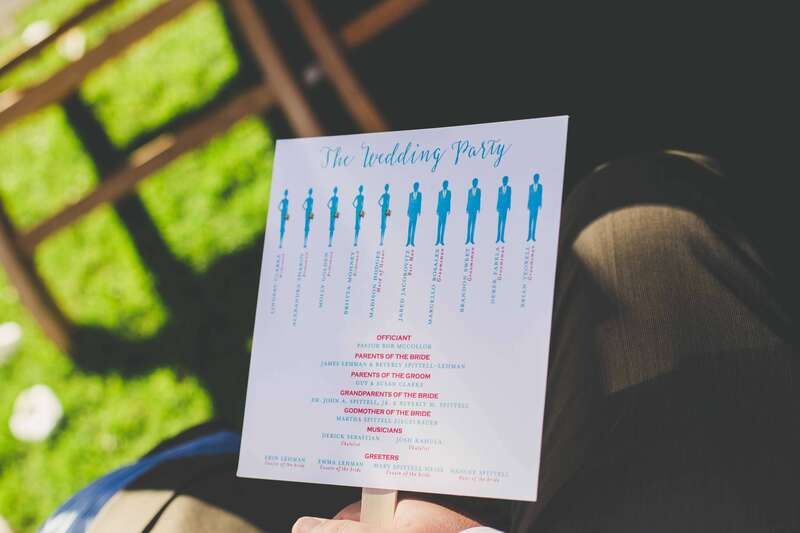 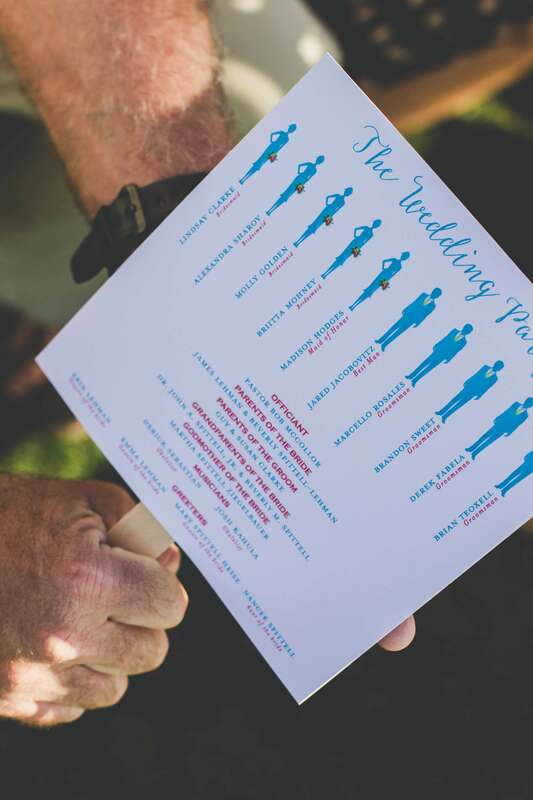 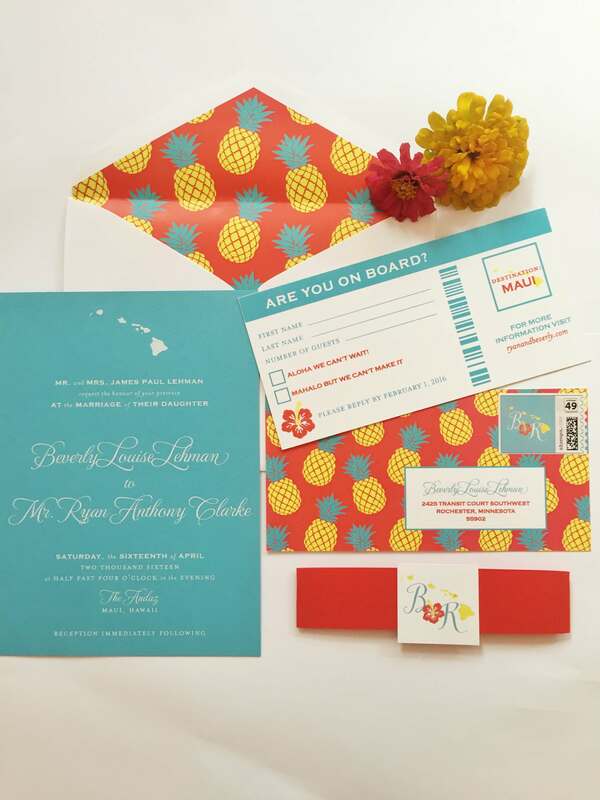 The bridesmaids were dressed in all shades of blue and turquoise to match the ocean in the ceremony background, as well as the foil stamped wedding invitations on our aqua marine 2 ply card stock. 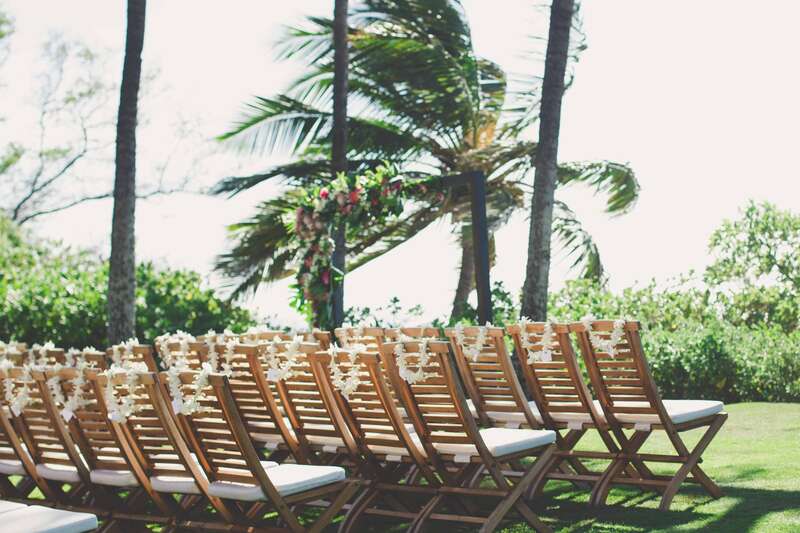 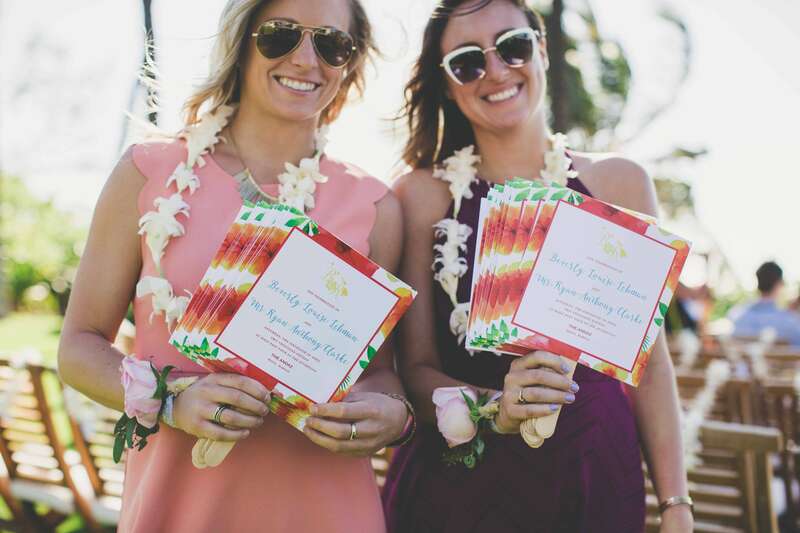 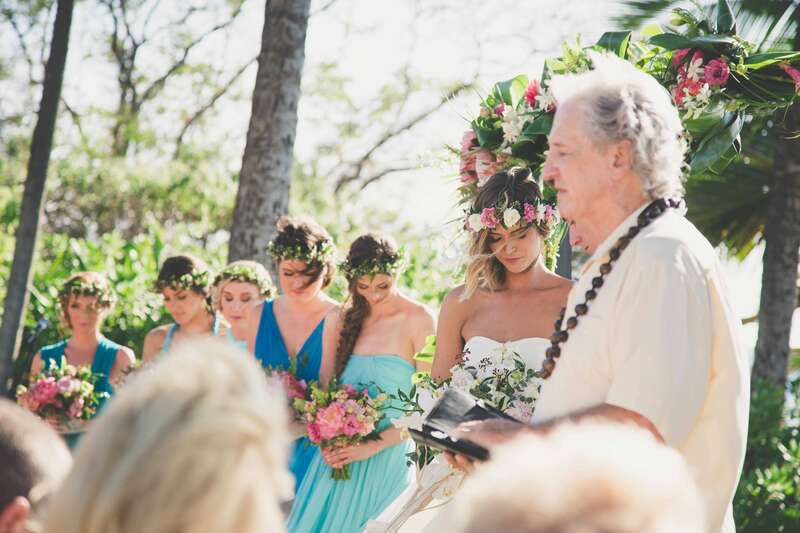 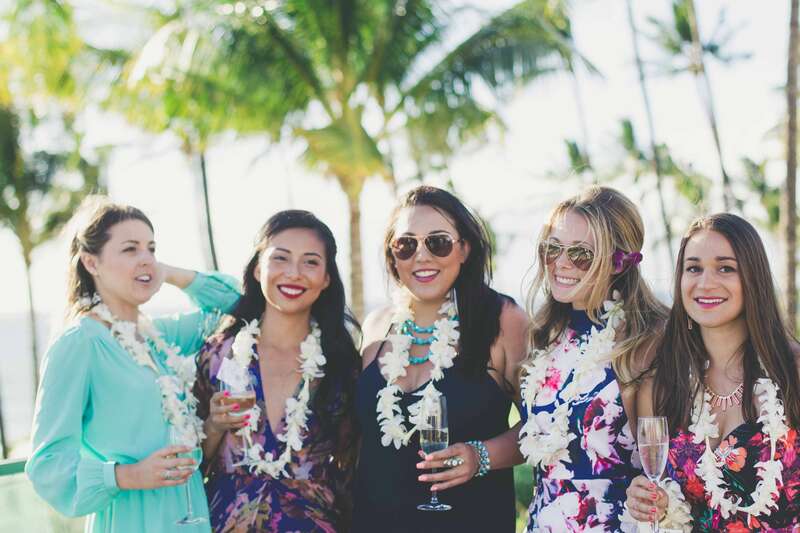 Leis were placed on every seat at the ocean front ceremony of this boho chic Hawaiian wedding, for all guests to wear throughout the evening’s festivities! 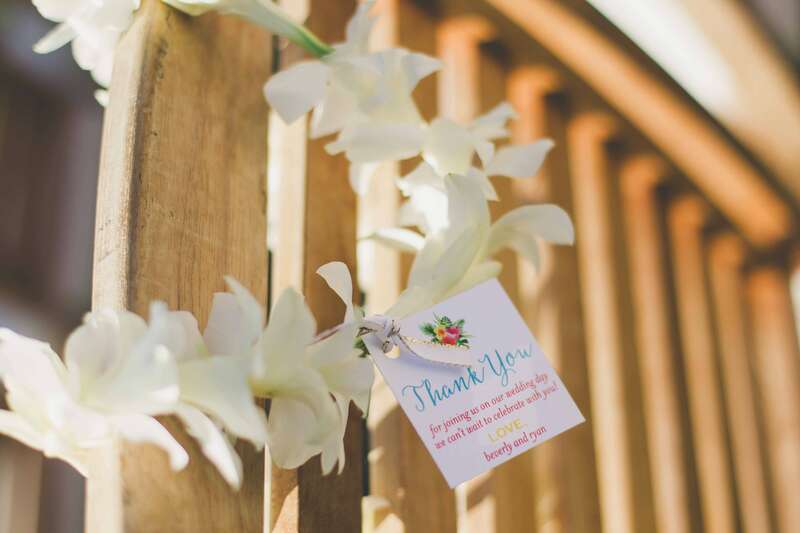 We made custom tags for each one, thanking the guests for coming and telling what their presence meant to the bride and groom! 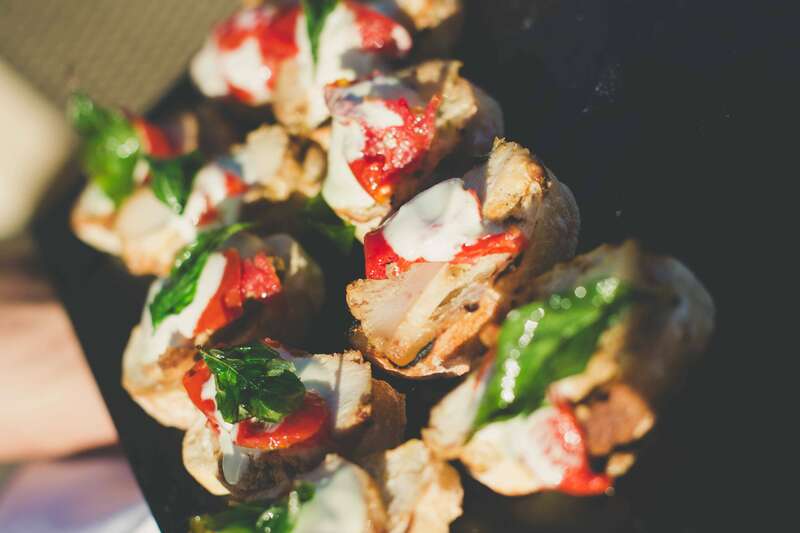 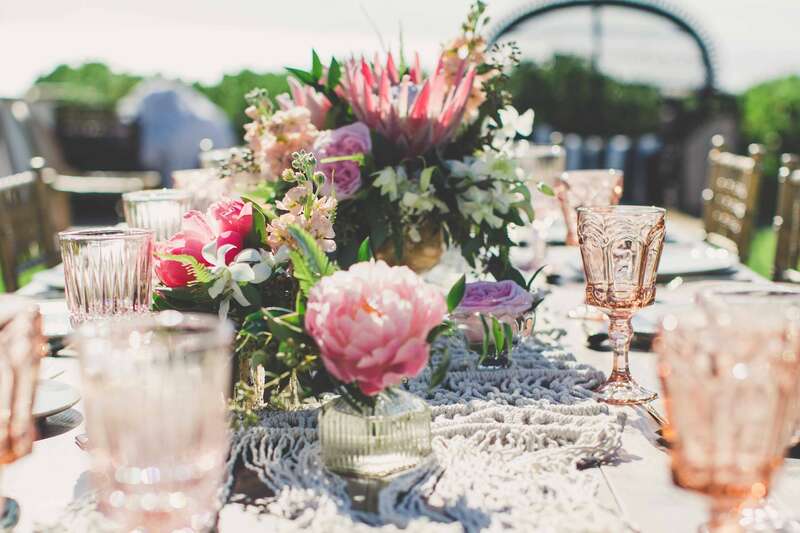 It was a night filled with love, laughter, and partying under the stars amongst twinkle lights. 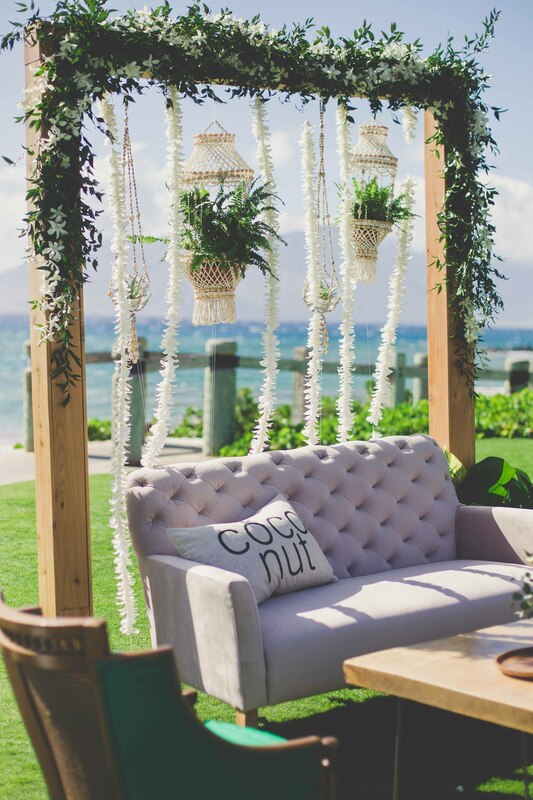 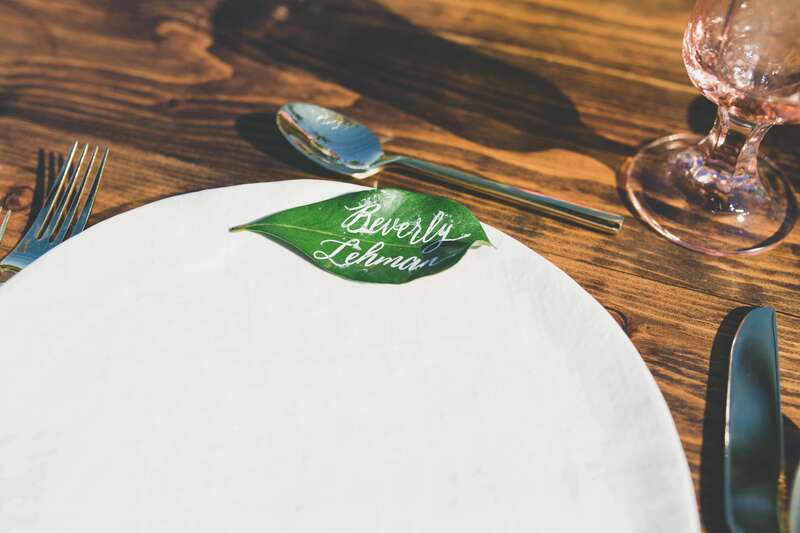 The Bohemian, beachy attitude was also evident with the shell chandeliers and place cards written on leaves in white calligraphy. 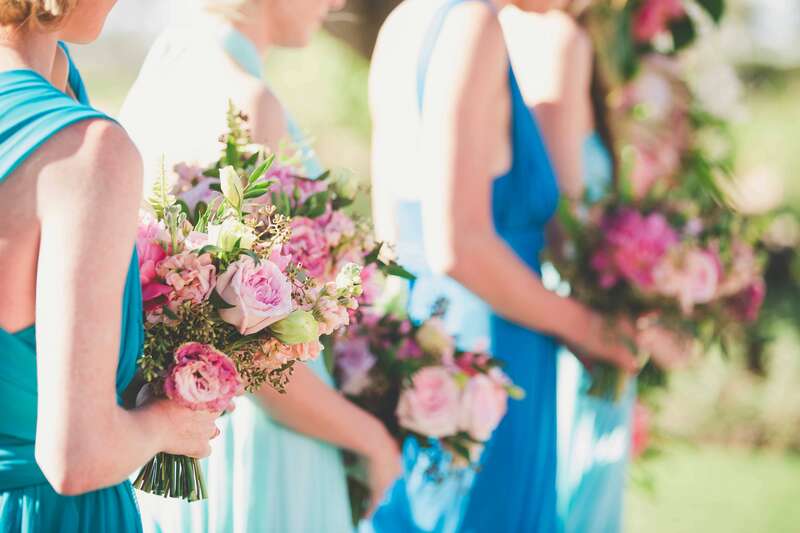 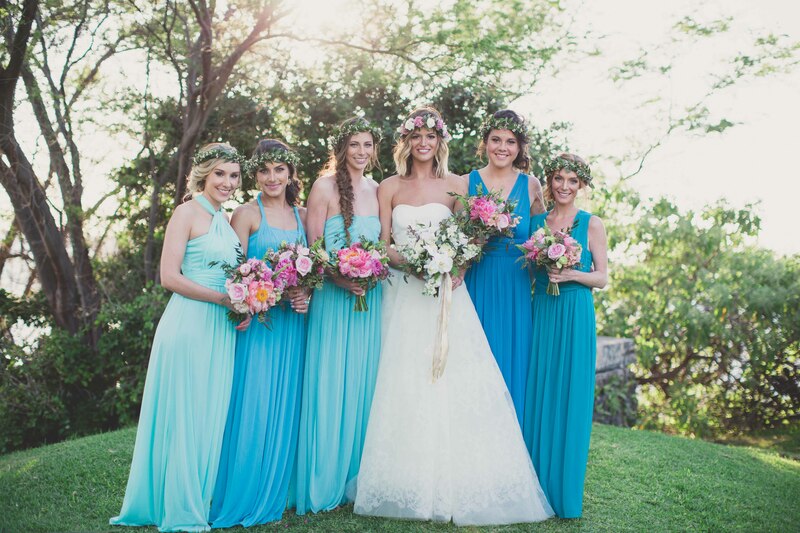 Enjoy the gorgeousness of this boho chic celebration!